Step 1. Measure the circumference of your dominant hand just below the knuckles, excluding the thumb. Step 2. Pick the size that closely matches your measurement. These gardening gloves feature an extra-long gauntlet that protect you right up to your elbow. The gauntlet is made out a premium quality leather and you'll receive the same professional protection all the way up your forearms to your elbow. Effectively Gloves to protect your hands from injury while you are facing on cuts, scratches, sharp thorns, pricks, rough stuff and working for handling cactus, pruning roses/ berry / prickly bushes, citrus picking ,doing yardwork, garden pruning, trimming shrubs and so on. SUPERIOR DURABILITY & COMFORTABLE: The glove palm part is made of Genuine Goatskin Leather, can provide you the best durability and comfortable, as well the dexterity when you do your gardening works. 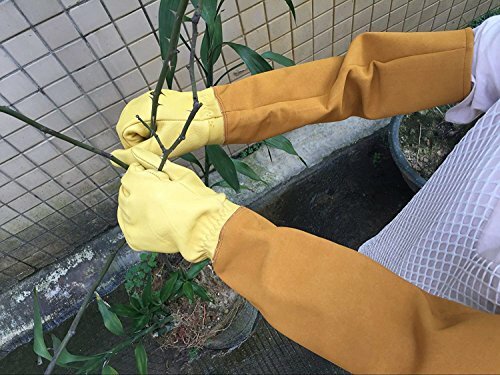 LONG SLEEVES: Extra Long Sleeves protect your hand from stinger,thorns & prick; the sleeves is also 100% leather, they will be more soft to touch & more breathable, NON-Toxic than artificial leather. CARE DESGIN: Ergonomical design around the palm and fingers allows you to easily grip your garden tools. Wide Application: Effectively protect your hands from injury and puncture resistant while you are facing on cuts, scratches, sharp thorns, pricks, rough stuff and working for pruning roses, handling cactus, pruning berry and all prickly bushes, citrus picking ,doing yardwork , garden pruning, trimming shrubsand other unpleasantness, provides a great grip on everything you need.